Taschner's prowess as a violinist of superb repute has already been demonstrated by MD&G's issue of several chamber works in a four-CD set issued last year. This time we are offered two strikingly different concertos conducted by lamented past masters. Fortner's music is a cross between the savagery of Schoenberg matched with Berg's lyric vein but is also quite strikingly original. This concerto is brilliantly played by the soloist who also receives superb accompaniment by Furtwängler. The Beethoven Concerto is up against formidable competition in the shape of Campoli, Elman, Ferras and Kulenkampff, to name but a few yet Taschner's beautifully assured string tone is quite a perennial delight. The work is masterly paced by Solti who was to record a memorable version of it with Mischa Elman for Decca just a couple of years later. I much prefer this emotional live relay from Berlin-Dahlem in 1952. 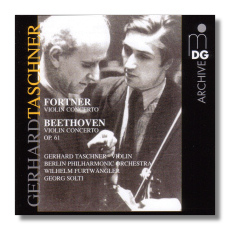 MD&G has remastered the recordings with superb technical quality and this issue is an essential complement to the previous box set devoted to the magic violin of Gerhard Taschner.